Steve Brustein and Michael Weaver with summer flounder, scup and black sea bass (warm water fish) they caught in Narragansett Bay this summer. Cold water fish like winter flounder have moved out. As a fisherman, I was excited when I first got my eyes on the State of Narragansett Bay and Its Watershed Report that was released in Rhode Island last year. I was pleased to find out that Narragansett Bay and the rivers that feed it (including the Blackstone, Tauton and Pawtuxet Rivers) are much cleaner. The discouraging news was the accelerating impact climate change will have on our salt marshes, the sea grass, fish populations, Narragansett Bay and surrounding communities. Air temperature, water temperature and sea level are rising. The lessons learned from this estuary report are broadly applicable to estuaries in other parts of the county and provide an opportunity for better management, protection, and restoration of coastal ecosystems generally. Dr. King is Science Advisory Committee Chair of the Narragansett Bay Estuary Program (developers of the report) and a professor of Oceanography at the Graduate School of Oceanography, University of Rhode Island. King, and colleagues from partner organizations that contributed to the report, highlighted key report findings at the workshop. 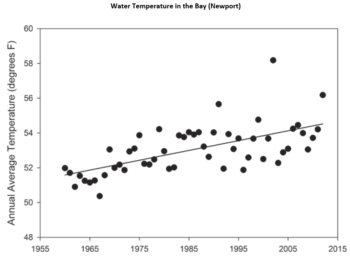 The water temperature in the Bay has risen 2.9 degrees F from 1960 to 2015. From the 1800s to 1970 we lost over 50 percent of Narragansett Bay salt marshes due to development and other factors. Recent observations and future projections suggest that a large percentage of the existing marshes will be lost with accelerating sea level rise affecting the fish and wildlife of Narragansett Bay. “These salt marshes act as filters for the Bay. Water flows into them from the rivers and then into the Bay. Without them we have no filters,” said Kutcher. The report relates that more needs to be done to combat the effects of climate change as the data is unquestionable that it is accelerating at a faster pace. The report relates that from 1960 to 2015 air temperature increased approximately 2.7 degrees F and water temperature rose 2.9 degrees F. Additionally, the National Oceanographic and Atmospheric Administration (NOAA) projects that sea level could rise as much as nine to eleven feet at Newport, RI by 2100. A key finding of the report is that the bay water is cleaner, which proves that investments are paying off. Over the past several decades research and monitoring conditions have steered action plans that dramatically improved the bay and watershed. Investments in wastewater treatment facilities and restrictions on excess nutrients have created a dramatic drop in pollution. The report revealed a 55 percent decrease in total nitrogen from wastewater treatment facilities and a 45 percent decrease in total phosphorus. A variety of factors can cause changes in the abundance and mix of fish species living in estuaries, such as fishing pressure, weather patterns, water quality, pollution, loss of habitat, and disease. Fishermen have known for a while that the composition of fish in the Bay has changed. 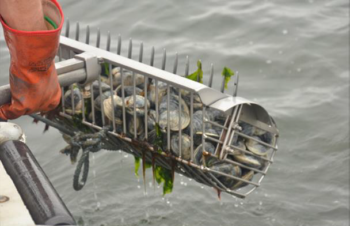 You might say there will be some fish species that win by thriving in our new warmer bay and others that may lose, meaning they will leave Narragansett Bay for a more comfortable environment. 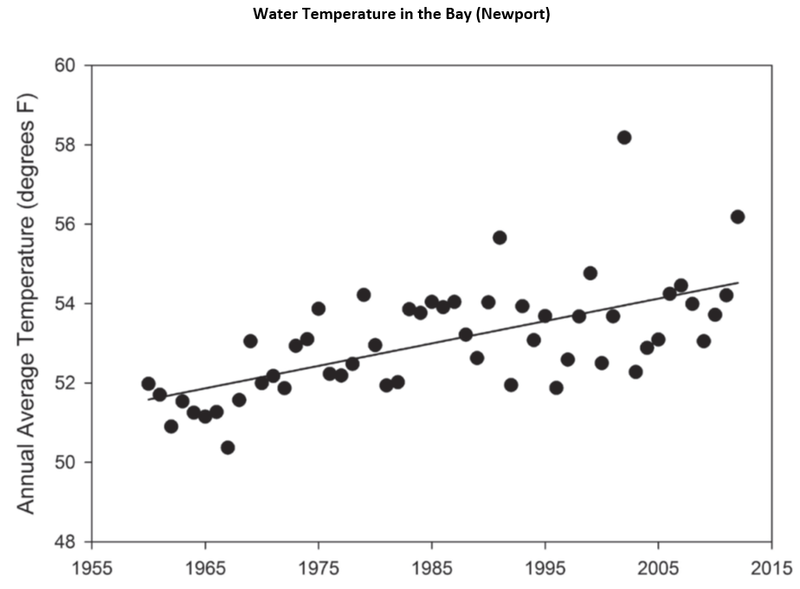 Warming of coastal waters and the Bay has been documented here over the last 60 years and is projected to continue into the future. As the bay and watershed report relates, climate change is real and its impacts on the fish are accelerating. Climate change needs to factor into our catch/harvest models. In addition, climate change must be a major consideration when revising our national fishing laws. The perfect example in the northeast is black sea bass. As all who fish these waters know, you can hardly put a line in the water in the northeast without catching black sea bass. Yet, our harvest limits are less and less each year. We keep catching them because they are now in our region in abundance. The catch and harvest limits have not yet considered the full impact of warming water and the movement of these warm water fish into the region. The report concludes with a call to action to obtain more funds for research and monitoring so comprehensive plans can be developed to adapt and mitigate the impacts of climate change. A copy of the State of Narragansett Bay and Its Watershed Report can be found at www.nbep.org. The workshop where this report was presented did take an unexpected turn when the Estuary Program found out three days before the Workshop that three of the Environmental Protection Agency (EPA) scientists scheduled to present at the Workshop were denied the opportunity to present their science on climate change by their boss, Charles Pruitt, EPA administrator. The Rhode Island congressional delegation at the workshop and Dr. King, Chair of the Science Committee, all expressed their disappointment with the decision to silence the scientists. A group of about 30 conservationists picketed the front entrance of the workshop with green tape covering their mouths to protest Administrator Pruitt’s decision to silence the climate change scientists. Click here to see Stephen Colbert’s segment on this issue.